Using Tholco Real Estate Group! Tired of paying high real estate commissions? 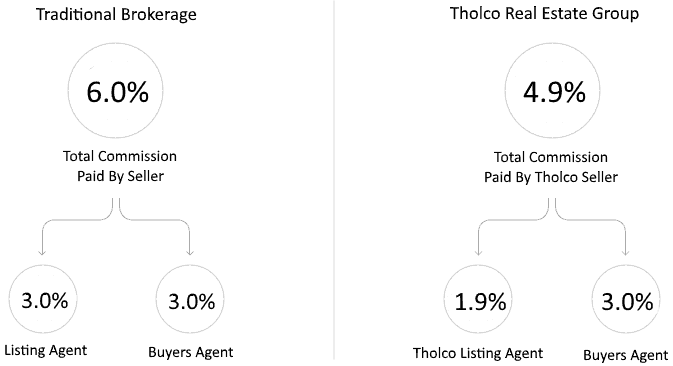 Tholco clients pay less than the typical listing fee when you sell with us! Normally, brokerages charge commissions that are 6% of the home’s selling price. The buyers agent and listing agent each gets 3% and split the total commission. Sellers always pay the commission for both sides of the transaction. At Tholco, we reduce our commission to 1.9%, which lowers the total commission to 4.9% and puts more money in our sellers pocket! Use the slider below to see how much you could save with Tholco! List your home with us and pay only a 1.9% listing fee. We discount our fee but never discount our service. You’ll receive top-notch service and could save thousands! Contact us anytime for your free consultation, there’s no obligation and we’ll also provide a free, accurate valuation of your home. We’re here when you need us… seven days a week! I'm interested in selling my home and would like a free, no obligation valuation consultation with a Tholco Agent.